Tim was born in Barberton, OH in 1958, is a graduate of the University of Akron School of Law and has been licensed to practice law in Ohio since 1985. Tim has been an officer of Leiby Hanna Rasnick Towne Evanchan Palmisano & Hobson, LLC since 1995 and has devoted his practice to representing injured individuals throughout his career. 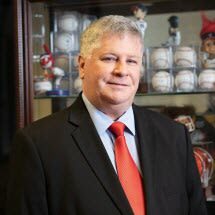 For over 20 years Tim has been dedicated to handling complex damage cases, including catastrophic personal injury and wrongful death cases arising from automobile accidents, truck accidents, work place accidents, defective products and medical negligence. Tim and his paralegal, Chris Locke, hold the highest legal, professional, and empathetic standards in their work with clients. If you are faced with an unfortunate and traumatic personal injury, wrongful death, or other catastrophic damage case you will want to be able to depend on your attorney to provide the most thorough legal attention with full respect for the sensitive nature of the circumstances. Tim has been selected to Ohio Super Lawyers 2008 -2009. He is a member of the Ohio Association for Justice, the American Association for Justice, the Ohio State Bar Association and the Akron Bar Association. Our Client underwent a mitral valve repair at a Cleveland hospital. Our Client developed pericardial effusion. Our Client was taken to a local hospital's emergency room where they failed to properly treat the pericardial effusion. The pericardial effusion developed into cardiac tamponade, which eventually caused Our Client's heart to stop. As a result, Our Client suffered permanent brain damage. A very substantial settlement was reached with the hospital. Our Client was a 16 year-old boy who was killed while riding as a passenger in a car that was struck by a train at an unguarded railroad crossing. A jury determined that Our Client's family and a Railroad Grade Crossing Safety Foundation that was formed as a result of Our Client's death was entitled to $8,000,000. Our Client was a 36 year-old father who was killed when the car he was driving was struck by a tractor-trailer. A very substantial settlement was reached with the trucking company. Our Client worked at a large manufacturer and got his hand stuck in the clamps of an unguarded press. Our Client suffered two broken fingers. A jury determined that Our Client was entitled to $2,400,000. Our Clients were riding as passengers in a car that was struck by a tractor-trailer. A 42 year-old father and a grandmother were both killed in the collision. A grandfather, a 40 year-old mother and three children were seriously injured. A very substantial settlement was reached with the truck driver and Our Clients' insurance company. Our Client was involved in a hotly contested divorce. During the divorce proceedings the ex-wife accused Our Client of sexually abusing the couple's 5 year-old daughter. Our Client sued his ex-wife for defamation, intentional infliction of emotional distress, invasion of privacy, abuse of process and fraudulent transfer. A jury determined that Our Client was entitled to $1,211,000. Our Client worked at a large manufacturer and was injured when he stepped into an unguarded hole in the operating area of a machine. Our Client suffered complex regional pain syndrome. A very substantial settlement was reached with the company. Our Client was an 18 year-old college student who was killed when the car he was driving was struck by a drunk driver. A very substantial settlement was reached with Our Client's insurance company. Our Clients were involved in a two-car collision. One of Our Clients suffered a significant arm injury. A very substantial settlement was reached with Our Clients' insurance company. Our Client was struck by a car while riding his motorcycle. Our Client suffered a serious leg injury. A very substantial settlement was reached with Our Clients' insurance company. Our Client underwent a diaphragmatic hernia repair at a Canton hospital and developed sepsis. The sepsis ultimately led to septic shock and Our Client died. A very substantial settlement was reached with the surgeon. Our Client was struck by a car while walking down the road. Our Client suffered severe facial fractures that required extensive reconstructive surgery. A very substantial settlement was reached with Our Clients' insurance company. Our Client worked at a large manufacturer and had the heel of his foot blown off by an unguarded sandblaster. A very substantial settlement was reached with the company. Our Client was injured when she fell out of a chair after undergoing a test at a hospital. Our Client suffered a fractured hip. A very substantial settlement was reached with the hospital. Our Client worked at a large manufacturer and was struck while on a picket line by a vehicle being driven by a member of management. Our Client suffered bursitis in his hip as a result of the collision. A jury determined that Our Client was entitled to $300,000. Our Clients were stopped at a red light when a drunk driver ran into the back of their car. Our Clients suffered strains and sprains. A very substantial settlement was reached with the drunk driver. Our Client was injured when a car being driven by a drunk driver struck the sofa she was lying on while watching television. Our Client's husband was in an adjoining room and witnessed the collision. Our Client suffered an injury to her ankle. Our Client and her husband both suffered emotional distress. A jury determined that Our Clients were entitled to $132,000. Our Client was a 19 year-old foreign exchange student from Japan who was killed in a two-car collision. A very substantial settlement was reached with the drivers of the two automobiles. Our Client was injured in a two-car collision. Our Client was taken to a local hospital for treatment. The hospital billed the negligent driver's automobile insurance company rather than Our Client's health insurance company, which resulted in Our Client receiving less money than she would have received if the hospital billed the correct insurance company. The Court found that the hospital had committed insurance fraud. In keeping with the Ethics Rules of the Ohio Supreme Court and the privacy of our Clients, Leiby Hanna Rasnick Towne Evanchan Palmisano & Hobson, LLC does not publish, advertise or broadcast the specific amounts of settlements. We may be able to discuss the results of past cases with you privately.